2018 marks the 40th anniversary for the Madison Area Chapter, EGA, and we invite you to join us for the celebration! 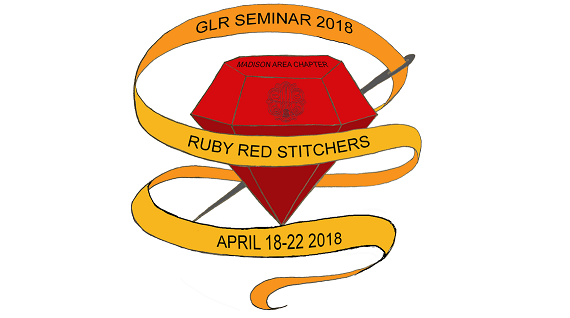 Ruby Red Stitchers, GLR Seminar 2018, will be held at the Madison Marriott West Hotel in Middleton on April 18-22, 2018. We have selected a variety of teachers and techniques for your stitching pleasure and we are looking forward to sharing a week of fun with you. Along with the usual four days of stitching, we are planning a few surprise "gems" for your enjoyment. Help us make this a memorable experience for all! Registration is now open! The first day of registration is August 1, 2017. Registration envelopes received on or before Nov. 15, 2017 will be considered for priority class assignment purposes. After Nov. 15th registrations will be processed according to date received (see page 4 in registration booklet). The Registration Book (3.3 Mb) is available for you to download. You may also download a blank Registration Form (622 kb) separately. Note - if you right click on the link for the form, you can then save it to a folder on your computer. Open your saved file with Adobe Acrobat Reader DC, then select "Fill and Sign" from the tools menu on the right and type in your responses. Save and/or print. All seminar participants must be registered guests with the hotel, for insurance purposes. Reservations can be made now for our room block at the Madison Marriott West. The seminar rate is $139 per night (plus tax). Please make your reservations directly with the hotel by March 21, 2018 by telephone at (800) 228-9290. If you call, be sure to request the EGA-Great Lakes Region seminar room rate. If you are sharing a room be sure to let the hotel know the names of all the participants in the room. NOTE: Due to an unforeseen conflict with our headquarters hotel, our block of rooms are not available on Tuesday night, April 17. Therefore, we have made arrangements for a block of rooms at the Holiday Inn Madison West, for Tuesday at the same seminar rate of $139.00.